Save money with this value package! Air Optix Night and Day Aqua contact lenses are designed to be worn for one month. According to the manufacturer, Alcon, these lenses can be used for daily wear (insert in the morning and remove them in the evening), but they can also be worn continuously without removing, even while you sleep. 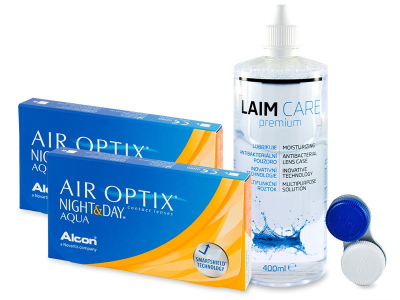 Air Optix Night and Day Aqua contact lenses are exceptional for their high oxygen permeability, which allows a sufficient supply of oxygen to reach the cornea, even during sleep. Each box contains three lenses.